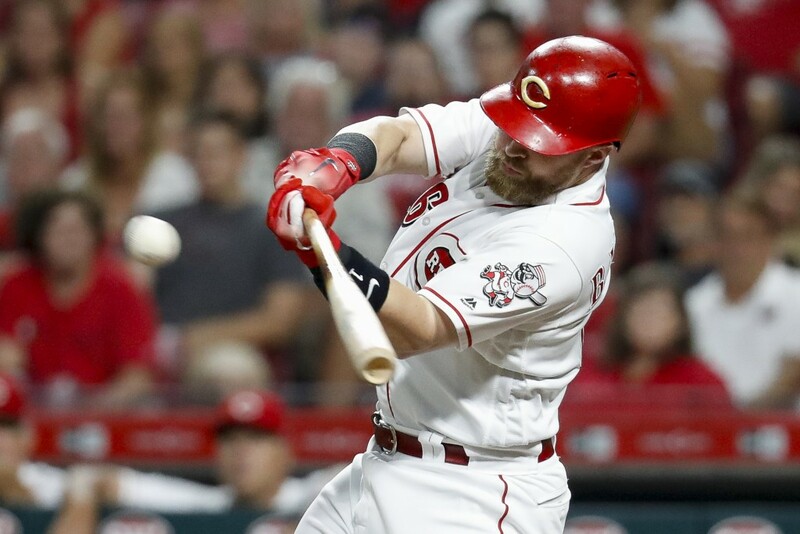 CINCINNATI (AP) — Pinch-hitter Tucker Barnhart's two-run double highlighted a four-run rally in the eighth inning and the Cincinnati Reds beat the Arizona Diamondbacks 6-3 Saturday night. Archie Bradley (3-4) hit Eugenio Suarez with a pitch to lead off the inning and walked Curt Casali with two outs. Barnhart lined a 3-2 pitch up the left-center field gap and Billy Hamilton and Joey Votto followed with RBI singles. Arizona, which began the night tied for the NL West lead, lost back-to-back games for the first time in more than two weeks. 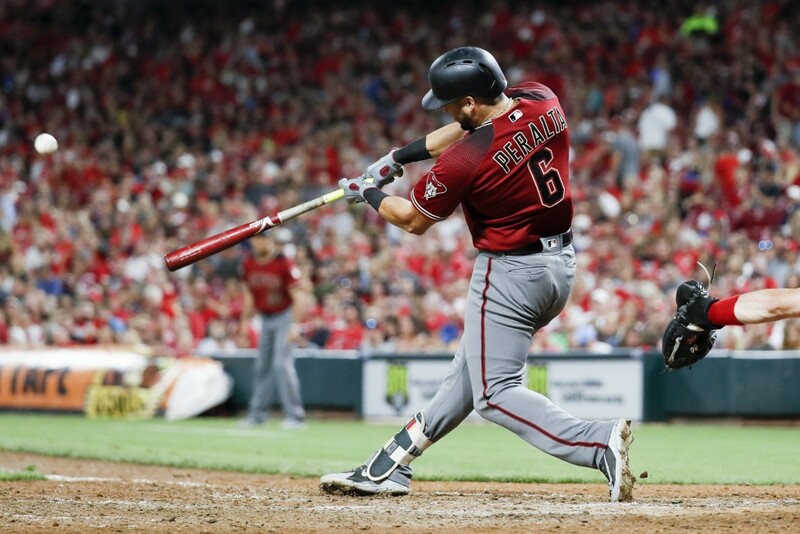 Eduardo Escobar hit a two-run homer, his first since being traded from Minnesota to the Diamondbacks, and David Peralta also connected. Amir Garrett (1-2) got the final out of the eighth. Raisel Iglesias pitched the ninth for his 23rd save and second in two nights. Arizona starter Robbie Ray left after five innings with the score tied for his fifth straight no-decision. The left-hander, who hasn't won in eight starts since June 27, allowed two runs on four hits with two walks and six strikeouts. Reds starter Matt Harvey fanned seven in seven innings, his highest strikeout total since he had seven on June 10, 2016, with the Mets. He also hit an RBI single in the fourth. Diamondbacks: Hamilton's eighth-inning hit grazed LHP T.J. McFarland, but he stayed in the game. Reds: Votto didn't start, the third time he was out of the lineup in Cincinnati's last four with a bruised right knee, suffered when he was hit by a pitch from Ryan Madson on Aug. 4 in Washington. Votto was intentionally walked as a pinch-hitter in the seventh. Diamondbacks: RHP Zack Godley (12-6) is tied with teammate Zack Greinke for the second-most wins in the National League behind Washington's Max Scherzer. 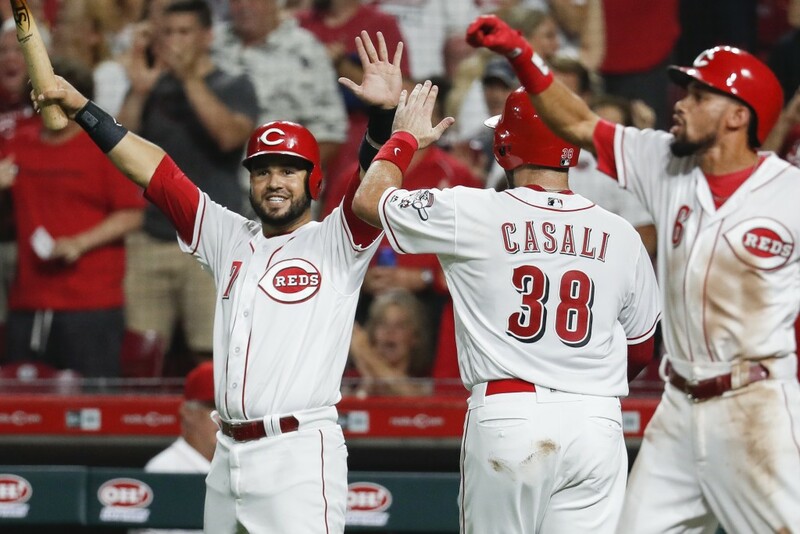 Reds: RHP Luis Castillo (6-9) allowed five runs, four earned, on four hits and three walks in five inning in a 5-2 loss to Godley and the Diamondbacks at Arizona on May 29.